Two more poachers have been arrested by the forest officials of Rajiv Gandhi Orang National Park on Tuesday who were allegedly involved in killing a leopard using poison and collecting its parts, official sources said. They have been identified as Rajak Ali, and Fazal Ali. Both hail from Fatashimalu in Sonitpur district under Dhekiajuli police station. Earlier on Saturday last, four poachers was arrested by the Orang Range Officer of Rajiv Gandhi Orang National Park and forest officials recovered tiger skin and bone from them while it was hided in the ground. The poachers have been identified as Abdul kashem, Jiabur Rahman, Raful Ahmad and Aijul Islam. All of them hail from Data Somali under Dhekiajuli police station of Sonitpur district. The figure now goes up to eight as earlier on June 18, two other poachers were arrested with tiger bones, skin and teeth. 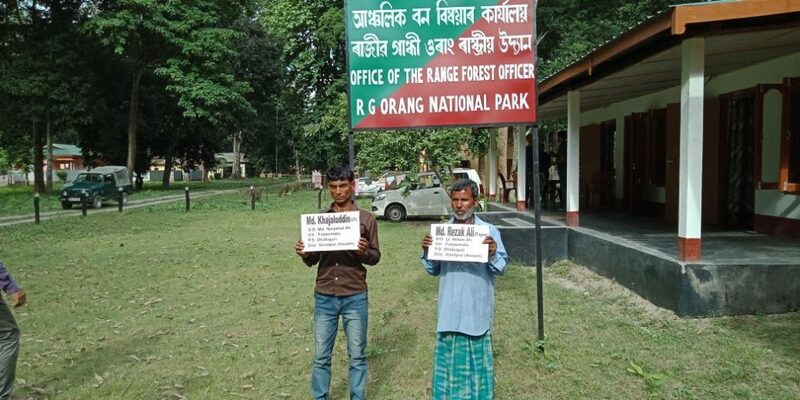 The forest officials produced them in the Tezpur court after arrest. Officials of the Forest Department claim, these poachers were involved in killing quite a few big cats in the national park. They were later sent to judicial custody.